After a strong rise in recent weeks, APA's securities reached a new four year high of $4.45 on 11 November. No specific news appears related to the rise, although in early November APA completed its debt refinancing program and set up new debt facilities of $1.4 billion. While Sims Metal Management's Remuneration Report was comfortably passed by shareholders, the Long Term Incentive Plan for chief executive Daniel Dienst received a strong no vote. There were 45,942,062 no votes, or just over 30 per cent. Chairman Paul Varello told the annual general meeting that the strength of the company's balance sheet is without peer in its industry. "At the end of the financial year, the company had net debt balances of approximately $126 million, undrawn lines of credit of approximately $1.4 billion and shareholder equity of $2.9 billion," he said. The Sims Recycling Solutions division is now the world's leading recycler of electronic goods and equipment. In 2010-11 "it was particularly acquisitive and increased its global geographic footprint in response to the increasing community demands for the safe and efficient recycling of end of life electronic products". In fiscal 2011, the company also achieved its best ever health and safety performance. Sims Metal Management director Robert Lewon has ceased to be a director. Bob Lewon has been a director since March 2008, but has ties with Sims that go back to the late 1980s when Simsmetal made its first acquisition in North America. Among the attendees at the Melbourne AGM were Christine Crabb, the wife of John Crabb, the managing director when Sims was relisted on the ASX 20 years ago and who passed away in February this year. Also present was former chairman, Paul Mazoudier, who joined Simsmetal in 1974; and Bill Proler, who runs Sims' US Southern Region operations out of Houston, and whose family invented the automobile shredder which is used by most major metal recycling operations around the world. Dart Energy (CBM) International Pte Ltd (DECI) has become a wholly owned subsidiary of Dart Energy, with the 8.2 per cent held by Shell group exchanged for a mixture of cash and equity in Dart. DECI owns the great majority of Dart's assets and operations in China, India and Indonesia. Dart said the transaction will facilitate the full consolidation of DECI with its European and other non-DECI owned international assets as part of its strategic restructuring and financing plans. Consideration to Shell comprises US$12 million cash; 14,056,468 Dart shares which Shell cannot sell until at least 30 June 2012; 9,759,601 options over Dart shares exercisable until 31 March at 59.1 cents each and only if Dart's shares trade at above 99 cents for 5 or more consecutive days during the exercise period; and 5,492,357 options over Dart shares exercisable until 31 March 2014 and exercisable at 59.1 cents each if Dart's shares trades at above $1.30 for 5 or more consecutive days during the exercise period. The Dart shares and options issued to Shell, assuming the exercise of all options, would result in Shell holding 3.9 per cent of Dart on a fully-diluted basis. Dart said the cash amounts may not require Dart to utilize cash previously raised to fund drilling and other operational activities, and instead these will be funded from the disposal of non-core assets over the next six months, possibly including shares held in other listed entities and cash realizations for financial instruments. Executive chairman, Nick Davies, said "Shell retained a minority stake in the DECI entity post the demerger of Dart. The agreement with Shell removes Shell's legacy shareholding in DECI and paves the way for the full consolidation of DECI with other Dart International assets. This is a necessary precursor to considering and, if applicable, implementing various strategic initiatives for Dart Energy International as previously announced." Four Envestra directors participated in Envestra's recent share purchase plan - Olaf O'Duill with 23,438 shares, Ian Little with 15,625 shares, Michael McCormack with 23,438 shares, and John Allpass with 23,438 shares. (ASX: ENV). Warburg Pincus has increased its holding in Transpacific Industries from 33.9 per cent to 35.8 pr cent. As foreshadowed, Transpacific has invited tenders for its outstanding 6.75 per cent Subordinated Convertible Notes due in 2014. The invitation is in line with the capital management initiatives recently announced by the company. Transpacific will pay cash at a price to be determined by the company to repurchase all or part of the Notes. Ceramic Fuel Cells has raised £3.8 million ($5.9 million) through a placing and subscription at 7 pence per share. £3.8 million of the placement was to institutional investors and underwritten by Nomura Code Securities Ltd. £0.6 million ($0.9 million was by way of a subscription with an existing private investor in the UK. The company has also launched a rights issue and an overseas offer at the same issue price. The non-renounceable rights issue is 1-for-4 in Australia and New Zealand aims to raise up to $21.7 million at 10.8 cents per share. The overseas offer is for shareholders in the UK and other jurisdictions and seeks to raise up to £2.15 million at 7 pence per share. The funds will enable the company to increase volume production of its products to match the orders it has started to receive. The additional working capital will enable it to leverage economies of scale by placing volume orders with suppliers and to implement value engineering to reduce manufacturing costs, it said. Following recently orders and discussions with other potential customers, the directors said they believe that now is the time to invest in driving down the unit cost of the company's BlueGen and Gennex units and increase volume manufacturing of these products. The placement is underwritten by Nomura Code Securities. The subscription and rights issue are not underwritten. In other news, Ceramic Fuel Cells is among a group of leading UK companies in the micro-CHP (Combined Heat and Power) sector that have launched a report highlighting how micro-CHP can contribute to the UK's transition to greener heat and power generation if given the right government support. The report gives a road-map on how micro-CHP could replace condensing boilers in the home heating market, saying installation of over 1 million micro-CHP units in the UK by 2020 is achievable. But the right Government support is key to making it happen. The companies have launched a campaign to adjustment the policy framework, asking for raising of the Feed-in Tariff (FiT) for micro CHP to at least 15p/kWh, and commitment to continued support for micro-CHP after the initial pilot of 30,000 units. Infigen Energy's low security price was a key shareholder concern at the company's annual general meeting. One shareholder told the meeting her investment was 82 per cent behind, and another expressed disappointment at the loss of the dividend. Managing director Miles George said the past year was a challenging and turbulent one for Infigen and its security holders, and this was reflected in the security price's substantial decline during the period. But despite the turbulence, the management team remains focused on the key controllable objectives, he said. Chairman Mike Hutchinson also expressed frustration over the share price, and said that there is a huge discrepancy between the security price and the value of the company's assets. The market is ascribing almost no value to the large US wind farm portfolio, he said. In response to questioning on executive remuneration he said that no long term incentives have been paid to management. Despite these issues, the meeting was positive and all agenda items won strong support. business, which will still be sold when the right price can be achieved. Meanwhile, the company's focus is on reducing operating costs and developing more production capacity. Mr Hutchinson said tThe 48.3 MW Woodlawn Wind Farm has been completed on time and on budget. Woodlawn is adjacent to Infigen's Capital Wind Farm and provides enough renewable energy to power 23,000 homes. Also recently, the company received development planning consent for its 100 MW+ Capital 2 Wind Farm in what Infigen now calls the Capital Renewable Energy Precinct. This is on the eastern side of Lake George, north of Bungendore in NSW, and along with the Capital and Woodlawn wind farms also houses the site of its potential 50 MW solar project. Mr Hutchinson told Eco Investor that a Capital 3 Wind Farm could also be considered down the track, so the company clearly has high hopes for its Capital Renewable Energy Precinct. One reason is that the main Snowy Mountains to Sydney grid connection is directly overhead. Mr Hutchinsion said Infigen's 1,500 MW pipeline of renewable energy projects is a valuable asset. The strategy is to develop the projects so that they will be "construction ready" when conditions are favourable for investment. Discussions continue with potential co-investors. "We just ask that those setting the rules in these processes do not bend to the unproven assertions of a noisy minority that is not always as objective or disinterested in its representations as it claims. Imposing unwarranted regulation to appease noisy opponents can only handicap the attainment of important national renewable energy goals." Infigen has "welcomed the legislation to start to put a price on carbon. For too long the world's atmospheric polluters have emulated 19th and early 20th century industry in treating the environment as a free dumping ground for waste. That treatment saw the almost irrecoverable ruin of waterways and landscapes throughout the industrial world." Infigen director Phil Green from substantial investor The Children's Investment Fund (TCI) told Eco Investor that the Fund's call to have Infigen's assets sold has largely transpired with the sale of the European wind farms and the attempted but so far unsuccessful sale of the US assets. CO2 Group's partner CO2 New Zealand has won a $10 million carbon sequestration project for the Iwi Maori community on the North Island of New Zealand. CO2 Group holds a 45 per cent interest in CO2 New Zealand LP. The project, which will be undertaken in partnership with the Iwi and other local authorities, will bring additional benefits such as carbon based afforestation, erosion control and waterway management. "This is a significant project for CO2 Group and further strengthens our New Zealand business," said CO2 Group's chief executive, Andrew Grant. "It also diversifies our revenue streams and client base, and it is in line with our strategy of partnering with leading blue chip organizations, municipalities and government bodies." CO2 New Zealand also has $7 million of long term carbon contract sales with major New Zealand Emission Trading Scheme compliance parties. CO2 New Zealand is expanding its range of services to position it as a broader environmental services company. An example is the mapping of Pre-1990 forestry land it is currently undertaking for a range of clients. Owners of pre-1990 forest land are subject to deforestation obligations under the New Zealand Emissions Trading Scheme (ETS). The decrease in land value for some pre-1990 forest landowners as a result of the ETS rules will be partially offset by a one-off free allocation of New Zealand Units (NZUs) from the Government. Zealand Government for Pre-1990 forest allocations on behalf of its clients, said CO2. In Australia, CO2 Group has welcomed the passing of the Clean Energy legislation through the Senate, saying it creates legislative certainty for the industry, and provides new market opportunities for the business. Whilst the Carbon Farming Initiative (CFI), which became law in September. is the basis for the creation of carbon credits, the Clean Energy legislation allows only compliant credits (ACCUs) to be used by companies liable to pay the carbon tax to acquit their carbon liability. Mr Grant said "The Clean Energy legislation is a milestone occasion for the carbon offset industry, with CO2 Group well positioned to take full advantage of the opportunities that the legislation provides. "Not only does the legislation open up the company to more than 500 new potential customers looking to acquit their tax liability, but it also allows the business to expand into offshore markets through the repatriation of carbon credits. This is a truly exciting time for CO2 Group, with this legislation providing a framework that delivers us the prospect of rapid growth." ERM Power has increased its interest in Metgasco from 5.5 to 7.1 per cent. Algae.Tec said the introduction of a price on carbon approved by the Australian Parliament will boost demand for its technology by carbon dioxide emitting industries. Algae.Tec's algae growth system captures carbon dioxide pollution from power stations and manufacturing facilities. Executive chairman Roger Stroud said the Clean Energy Future (CEF) package  the carbon price, the $3.2 billion Australian Renewable Energy Agency and the $10 billion Clean Energy Finance Corporation  will deliver unprecedented interest in clean energy and proven carbon capture solutions. "The CEF package will encourage carbon emitting companies and industries to seek out carbon dioxide reduction technologies," said Mr Stroud. "This will significantly add to the commercial appeal of the Algae.Tec technology. Algae.Tec is one of few advanced biofuels companies globally with a closed modular engineered technology designed to grow algae on an industrial scale and produce biofuels that replace predominantly imported fossil fuels for transportation use," said Mr Stroud. Having received 90 per cent acceptances, Australian Renewable Fuels is moving to full ownership of Biodiesel Producers Ltd by compulsorily acquiring the 10 per cent it does not own. The company now has three operating plants at Largs Bay in South Australia, Picton in Western Australia and Barnawartha in Victoria with combined capacity of 150 million litres. Carbon Conscious has received the first carbon bio-sequestration options exercised since the passing of the Clean Energy Act. Origin Energy has exercised the 2012 component of its 2009 Carbon Plantation Agreement, and will bring forward the 2013 contract plantings into the 2012 planting season. The exercise of the option means Carbon Conscious will plant around 10 million native Mallee eucalypt trees in WA's wheatbelt region in the 2012 planting season, a fivefold increase on the previously anticipated planting for the year. Origin retains $163 million worth of commercial forestry options, which can be exercised for the three planting seasons of 2013 to 2015. Carbon Conscious said both companies anticipate further near term discussion around the balance of the options. The agreement is subject to a review by Origin of its existing plantations, expected within 21 days of the signed option. 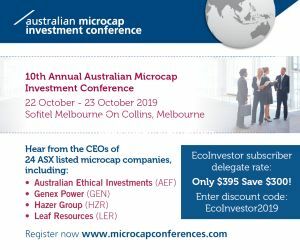 Carbon Conscious executive chairman Stephen Lowe said "We have always believed that when carbon pricing became a reality in Australia, Australian business would be eager to invest in carbon abatement projects. Carbon forest sinks offer the best opportunity due to proven technology, low project risk and scalability. "Origin is the first of many Australian companies expected to make substantial investments in carbon bio-sequestration. As the industry matures, the size and value of such investments is expected to grow significantly. This is a new multibillion dollar Australian industry in its infancy that will attract substantial investments from Australian and international companies." Australian Ethical Investment has invested in Carnegie Wave Energy. However, it did not say when it made the investment, its entry price, or through which fund or funds. What it has highlighted is that Carnegie has proprietary wave energy technology, it has just begun producing electricity at the southern hemispheres first commercial scale wave power farm near Garden Island off the WA coast, and that its system is distinct from most other wave energy systems by being anchored to the sea floor and cannot be seen from the shore. EcoQuest is to substantially restructure its bio-degradable nappy business. It will reduce the cost of goods to improve margins, increase distribution channels to improve revenue, and develop product specifications to improve competitive differentiation. In addition, the company will "more aggressively pursue acquisition opportunities" to build a diversified stable of environmental products over the next few years. The company will also substantially reduce recurrent costs. The board said the aim is to fulfil the objectives originally set for Eco Quest - to be a sponsor of leading-edge environmentally sustainable products. Eden Energy is the latest company to enter a fund raising agreement with La Jolla Cove Investors Inc.
Eden will issue up to three $1 million convertible notes. Eden said the facility will give it flexibility and supplement the funds to be raised under the pro-rata non-renounceable rights issue it recently announced. The first note will be issued on or around 14 November, when Eden will receive the first instalment of US$250,000.00. The payment of the balance will be by monthly instalments of US$250,000. There appear to be some measures in place to help reduce the potential impact on Eden's share price if, as it usually does, La Jolla sells large numbers of converted shares on market. Eden must issue the first note, but can elect whether or not to issue the second and third notes. If it does not issue the second or third note, either party can terminate the funding agreement. La Jolla can then either convert any advanced but unconverted principal into shares, or redeem the principal at a cash price of 120 per cent of the principal, plus any unpaid interest of 4.75 per cent per annum. If on the day La Jolla issues a conversion notice the Volume Weighted Average Share Price is below 7 cents, Eden has the right to prepay that portion of the principal plus any unpaid interest at 105 per cent of the amount. The Funding Agreement provides for the downward adjustment of the floor price in some circumstances. Eden is paying La Jolla a Funding Agreement facility fee of US$60,000 through the issue of shares, and will pay a further US$60,000 fee through shares on the closing date for the issue of the second note. Eden will seek shareholder approval for the issue of the second and third notes, which is one of the conditions of the agreement. The funds to be raised are for working capital. Meanwhile, Eden said its US subsidiary, Hythane Co, is continuing to make great strides" with its carbon nanotubes. The most recent advancement has been to produce high-quality multi wall carbon nanotubes (MWCNT) which are more valuable than the tubes it currently produces. High-quality carbon nanotubes are more desirable in many applications because of the integrity of the tube walls. which leads to higher strength in reinforcing applications. Higher integrity also gives better electrical conductivity in electrostatic discharge, sensor, and battery applications. The high-quality nanotubes do not break apart as easily during dispersion and maintain their high aspect ratio (the ratio of length to width). Higher aspect ratio materials can provide greater levels of reinforcement and allow lower loadings when electrical conductivity is desired. Enerji has raised $1 million through the placement of 55 million shares at 1.8 cents each to professional and sophisticated investors. The placement was arranged by Sydney based KS Capital. The new shares come with one for two options exercisable at 3 cents by June 2015.
carbon pricing scheme. The company said the clearing of the legislation through the Senate is a crucial step for Australia developing long-term clean energy options. Managing director Geoff Ward said "The introduction of this policy will be transformative for energy generation in Australia. We now have a real opportunity to direct funding and expertise into the development of new promising national scale technologies that will provide cleaner energy and the range of energy options that Australia requires for our long term energy security and long term, cost affordable power. Crucial to this are the pricing signals that will be established and the managed funding for the sector under the Australian Renewable Energy Agency (ARENA) and Clean Energy Finance Corporation (CEFC)." Greenearth Energy has raised $1.2 million from its 1 for 2 rights issue. The company will issue 15.3 million shares and unlisted incentive options. The company will seek to place a shortfall of 29.7 million shares with interested parties during the next three months. Greenearth Energy subsidiary, Pacific Heat and Power Pty Ltd (PHP), has been awarded a services contract with Newcrest Mining's Lihir operations for geothermal brine testing services. The project involves evaluating the low temperature brine that is currently under-utilized, using a specialized test rig. The project is part of Newcrest's efforts to maximize the value from the geothermal heat resources available to it. PHP has the lead coordination role between international equipment suppliers and local geothermal experts. The results of the project will provide information to select and design a Turboden Organic Rankine Cycle (ORC) system that maximizes geothermal power production and reliability while minimizing maintenance. Intec has participated in the entitlements issue by Bass Metals Ltd. Intec said it has foregone cash royalty payments for completed and anticipated minerals processing until the end of calendar 2011 at the Hellyer Mill in exchange for receiving 3.1 million BSM shares. The shares were issued 15 cents each and each has a free three year listed option exercisable at 20 cents. "The nominal face value of the foregone 2011 royalty payments has been discounted to the $465,000 investment amount, with ensuing royalties of $3.50 per tonne of ore processed, to a $5.725 million maximum (inclusive of foregone royalties)," it said. Intelligent Solar is looking to be recapitalized and relisted early next year following a Deed of Company Arrangement with the executor, Arowana Partners Group Pty Ltd and secured creditors of the company. Kimberley Rare Earths has appointed Michael Chan as General Manager  Project Development. Mr Chan commences on 12 December 2011. His number one priority is to deliver a Preliminary Evaluation Study or Scoping Study for the near term commercial development of the Cummins Range rare earths deposit. This will to assess the commercial viability of the project with an accuracy in the range of plus or minus 35 to 45 per cent. The Australian Tax Office (ATO) has published its Class Ruling on the June 2011 in specie distribution of shares in Kimberley Rare Earths by Navigator Resources. The in specie distribution was one KRE share for every 20 Navigator shares. The ATO determined that the value of the in specie distribution is 0.75 cents per Navigator shares. The ATO said the entire distribution should be classified as a return of capital, with no dividend component. In what it says is a first of its kind for the region, Mission NewEnergy is to build a major waste material processing facility in Malaysia that will allow it to recover palm oil from waste material in the palm oil refining process. The waste material, called Spent Bleached Earth (SBE), has historically had no application. "Mission is delighted to be working in collaboration with the government and the local palm oil processing industry. The facility will reduce waste being sent to the landfill, create jobs and provide Mission with a low cost, environmentally friendly raw material to produce biofuels," said group chief executive, Nathan Mahalingam. Producing biodiesel from this recovered non-food grade waste palm oil provides Mission with access to lower cost feedstock and increased margins. Green house gas savings are also increased. Mission expects to commence construction of the 66,000 ton per annum SBE Solvent Extraction Facility in January 2012 and the facility to be fully operational by September 2012. Mission has secured agreements and understandings with almost all the palm oil refiners in the State of Sabah to provide a supply of SBE and has received all necessary sanctions from government authorities including the Department of Environment. The facility will cost US$10 million and will be funded with equity and debt from a Malaysian commercial bank. Financial closure is expected by the end of December. Mission said palm oil refineries typically use bleaching earth to removing gum and other impurities when refining crude palm oil. The bleaching earth absorbs and retains some of the palm oil which cannot be recovered in the normal refinery process. Once the bleaching earth is used, it is referred to as Spent Bleaching Earth, a waste material that traditionally is disposed off in landfills. Mission NewEnergy has lifted its September quarter revenue by 297 per cent to $18.1 million compared to $4.6 million in the same period last year. on the settlement of the $15 million 2012 convertible notes and operating performance. During the quarter, the company significantly strengthened its balance sheet by buying back its 2012 convertible notes at a significant discount, said Mr Mahalingam. "The increase in revenue relates primarily to increased revenue from biofuel product sales and recognition of biological asset revenue from the company's Jatropha business of $3.2 million and the recognition of a gain from the buyback of the company's 2012 convertible notes of $10.3 million," he said. Nanosonics received a high no vote from shareholders of around 15 per cent for its Remuneration Report. Nanosonics' US distributor, GE Healthcare, says the launch of the Trophon EPR sterilizer has been encouraging. "A number of high-profile customers across North America have already installed the Trophon. Early feedback from these customers continues to indicate that Trophon is quickly being recognized as the preferred choice in automated ultrasound probe reprocessing. "Our GE team is enthusiastic about expanding globally to offer our customers an innovative technology that supports their patient safety initiatives and offers environmental benefits by eliminating the use of toxic chemicals and the associated OH&S risks," it said. "Our customers also value the rapid speed and automation of the Trophon EPR to enhance clinical workflow. "GE Healthcare has a large global installed base of ultrasound devices with a strong emphasis on women's health and reproductive medicine. We are pleased with the early acceptance of the benefits of the Trophon EPR in these areas." Trophon accessories are a mobile cart and a wall mount. Accessories in development include a printer, software and wipes. Nanosonics says the Trophon is a $1.5 billion opportunity. Panax has given Molten Power Corporation a six week extension to complete financing arrangements under which it will contribute the first $10 million in exploration and development funding for Panax's Indonesian Projects. Panax said it remains confident that Molten will be able to provide the funding. Managing director Kerry Parker said Panax is delighted to be progressing a partnership with a company of Molten Power's calibre. "Molten will bring additional strength of personnel and experience to Panax's advanced portfolio of projects in Indonesia, and it is clear that they have made sufficiently strong progress in their financing discussions to date. "Molten and its people have significant experience in large-scale geothermal development activities across the world, and they have recognised the quality and strength of Panax's portfolio of projects that have been assembled over the past 18 months." Under an August 2011 Heads of Agreement, within 90 days Molten will contribute the first $10 million in exploration and development funding for the Indonesian Projects. In return Molten will progressively earn into a 50 per cent interest in Panax's wholly owned subsidiary, Panax Geothermal Singapore No.1. After this Panax and Molten will contribute to costs on a 50-50 basis. Also within 90 days, Molten will subscribe for $1 million in equity in Panax at 2 cents per share, with attaching listed options on a one for two basis with a strike price of 4 cents per share and a three year term. Papyrus Australia has raised $1,052,000 by way of a placement of 21 million shares at 5 cents each to new and existing shareholders. The placement is in two tranches. The first tranche will occur immediately on receipt of cleared funds, and raise $722,000. The remaining shares will require shareholder approval at a general meeting probably in mid-December. The funds are for working capital, mainly to support the establishment of Papyrus Egypt, the Yellow Pallet Project and the completion of the construction of the Veneering and Fibre Production Units. Petratherm has welcomed the passage of the carbon pricing legislation through the Senate, saying the carbon pricing and clean energy funding initiatives represent the single most significant government assistance package for renewable energy in general and potentially for the geothermal energy sector. Southern Crown Resources has released the JORC compliant resource estimate on its Xiluvo rare earths project in Mozambique - a mineral resource of 1.1 million tonnes at 2.05 per cent total rare earth oxides (TREO) at a cut-off grade of 1 per cent TREO. The resource contains a good balance between light and heavy rare earth elements containing an above average quantity of the five critical rare earth oxides of neodymium, europium, terbium, dysprosium and yttrium (CREO)  projected to be in critical undersupply for the next 5 to 10 years, it said. Managing director, Dr Jock Harmer, said "Generation of an indicated JORC resource at our Xiluvo REE Project marks an important milestone for Southern Crown. Being unconsolidated and lying on surface, the soils represent a rare earth deposit that is expected to be easy and cheap to mine, positioned alongside excellent rail and paved road access to the port of Beira only 110 kilometres away. Contact Energy is offering of up to NZ$150 million of Capital Bonds to the New Zealand public, with the ability to accept oversubscriptions for another NZ$100 million. The Capital Bonds will be unsecured, subordinated, redeemable, cumulative, interest bearing debt securities. They have a maturity date of 15 February 2042 but can be redeemed on any interest payment date from 15 February 2017, and earlier in certain circumstances. The Capital Bonds will pay interest quarterly at a rate to be set after the close of the offer. However the minimum interest rate for the first five years to February 2017 will not be less than 8 per cent per annum, and will be set on 22 November 2011 and announced on or before the opening date for the offer. The offer is expected to open on 23 November and close on 15 December. The bonds will quoted on the NZX Debt Market (NZDX) under the ticker CENFA.